Lexcel is dhealth’s expert dental hygienist. She’s here to keep your teeth and gums healthy and ensure you have the information and motivation you need to keep up an oral health routine at home that will give you a healthy mouth for life. Lexcel is genuinely passionate about tooth and gum health. She knows the devastation that tooth decay and gum disease can cause. Cavities, tooth loss and periodontitis can all be avoided with regular visits to a hygienist. Apart from a passion from preventing decay in teeth and stopping the progression of gum disease, Lexcel enjoys nature. She can often be found hiking, hanging out with friends, trying different cafes or brunch places around Melbourne and, of course, travelling. Lexcel completed her Diploma of Oral Health (Dental Hygiene) at RMIT in Melbourne. Before completing her training in Dental Hygiene, she worked as a dental assistant for seven years and holds Certificate III and IV qualifications. 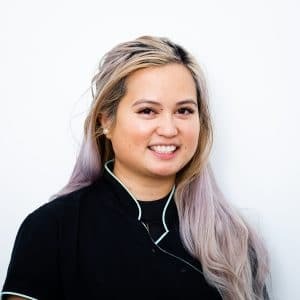 She has worked as both a specialised dental assistant in an orthodontic practice, as well as in general practices. What Can You Expect During Your Appointment with Lexcel? If you want to keep your teeth and gums healthy, you should visit a dental hygienist every six months. Lexcel will perform a scale and clean, which is a professional clean that removes the plaque and tartar that you just can’t get rid of with brushing and flossing. Lexcel will use sophisticated scaling and polishing tools to clean your teeth and gums, before using a fluoride treatment to restore your mouth to full health and protect against and decay or infection. The appointment also gives Lexcel a chance to check for any potential problems in your oral health. It also gives her an opportunity to monitor your at-home oral hygiene and ensure you’re brushing and flossing your teeth correctly. Visiting Lexcel is a vital chance to check on your dental health, and fix little problems before they escalate and become the type of issues that require large-scale and invasive procedures.